If social media are any indication, all the cool kids — including my friends Norb and Brian — are in Madison this weekend. The Wizard World Comic Con Madison is going on next door to what we used to call the Dane County Coliseum, an aging hockey barn that has also has seen some fairly remarkable rock shows. Brian rode with William Shatner in a hotel shuttle last night and saw Edward James Olmos and Lou Ferrigno at breakfast this morning. Name dropper. But Norb saw the Batmobile today. “I think it’s just a replica,” he said. This is as close as I’m going to get to the Batmobile this weekend. 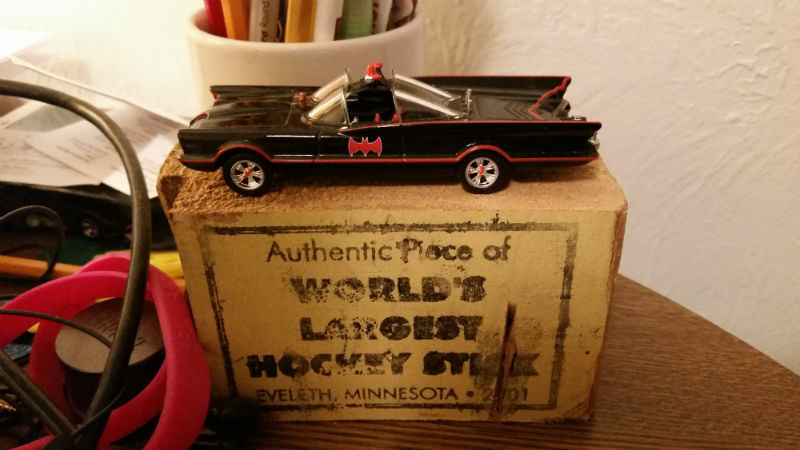 This Batmobile sits on my desk, just behind my Mac. It is, of course, one of the coolest cars from a childhood filled with cool cars. Adam West, the guy who sat behind the wheel of the real Batmobile, was to have been at Comic Con Madison this weekend, but he canceled because of what was said to be a scheduling conflict. I have long wanted to meet Adam West. But I’m not into autographs or selfies — I don’t need proof of such a meeting — so paying upwards of $50 extra just to shake his hand and say thanks seems pointless. It might have been enough just to see him from a distance. There’s always hope for a random meeting. We once rode in an elevator with Sam Kinison, so anything’s possible. But I suspect my chances of meeting Adam West are about as slim as another entry on my bucket list. I would love to have lunch with Paul McCartney. Vegan, of course. No pictures, no autographs, just a couple of guys shooting the breeze. Maybe Adam West could join us. 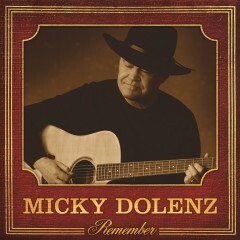 “Good Morning, Good Morning” Micky Dolenz, from “Remember,” 2012. Also available digitally. Here’s another mashup of ’60s icons, one of whom had another cool car, the Monkeemobile. As Dolenz tells it, John Lennon invited him to listen to his song — “Hey Monkee Man. Want to hear what we’re working on?” — as it was being recorded at EMI Studios in London in February 1967. A year later, a bit of this Beatles song was heard at the beginning of the final episode of “The Monkees,” one co-written and directed by Dolenz. Here’s that episode: “The Frodis Caper,” or “Mijacogeo,” from March 25, 1968. That’s an unknown Tim Buckley at the end, doing an acoustic version of “Song To The Siren,” which hadn’t been released at the time. I agree. Though I’d love to go to one of those “cons” the thought of paying for an autograph just seems weird. The Great Dane = remarkable rock shows? Yes (in decreasing degree of awesomeness): Hendrix, April 1970; Pink Floyd and Yes, late winter/early spring 1973; Blood, Sweat and Tears, spring 1969. Somewhere around 1967 Adam West (Batman) and Yvonne Craig (Batgirl) as well as the Batmobile were at the Dane County Coliseum. I remember going to see them at some event….I think WKOW was there…..maybe even Marshall the Marshal. Might have involved Dairyland Jubilee ?? ?